Quite often when I am making something a bit different for a weekend lunch D does his own thing and makes a sandwich for himself. He likes his sandwiches does my D. On many of these occasions we have sat opposite each other eating our respective lunches and I am consumed by jealousy. His roast beef and mustard toastie or cheese and ham bap have frequently looked much better than the botched tofu stir fry or sunken, stodgy souffle that sits before me and I have often regretted my sandwich rejection. This time it was D who looked longingly across the table at my perfect plate of fritters. And it was D who shoved his own plate away in digust. And it was D who begged for just a “wee taste, just to see what it tastes like. Go on. Go on. Go on!” And it was me who chuckled smugly at the reversed rolls. First of all make the batter. Sift together the flour and salt. Add the milk and egg and whisk until a smooth batter the consistency of double cream is formed. Add a little extra milk or flour if too thick or too runny. Set aside to rest. Meanwhile, chop the onion, green pepper and celery to approximately sweetcorn size. Heat 1/2 tblspn of oil in a non-stick frying pan and ;et the latter vegetables sweat in the pan for a few minutes. Add the garlic and cook for another minute before adding the sweetcorn and cooking until sweetcorn is heated through but onion etc still have a little crunch. Set aside to cool for five minutes. Add the vegetables and parsley to the batter and stir well. Season carefully. Wipe the non-stick pan clean then add the remaining 1/2 tblspn of oil to it. Smear the oil around the pan with kitchen roll. The frying pan needs only to be lightly greased. Get the pan very hot then add the batter to the pan 1 tblspn at a time, ensuring fritters do not touch. Cook fritters for 2-3 minutes on one side until little bubbles appear around the edges then flip over and cook for another 3 minutes on that side. Keep in a warm oven until all of the fritters are cooked and you are ready to dig into them. I served this with a dill, garlic and fromage frais dip. Nam nam. Oh yum. These also look like they’d be yummy with something hot and sweet, like a garlicky-salty-sweet-spicy dipping sauce. I wouldn’t want to share these either – they look fantastic – hey if you try different things you have the highs and lows of culinary exploration – no bad thing when it works! The dip sounds good. Could also work with some kind of chilli dip, methinks? ooh! These remind me of the wild rice and shallot silver dollar pancakes that I make for dinner sometime. I love the idea of the sweet corn in them. They do look lovely, and I’m glad you got your own back! I know exactly what you mean about having lunch-envy – it happens all the time in our house as well! 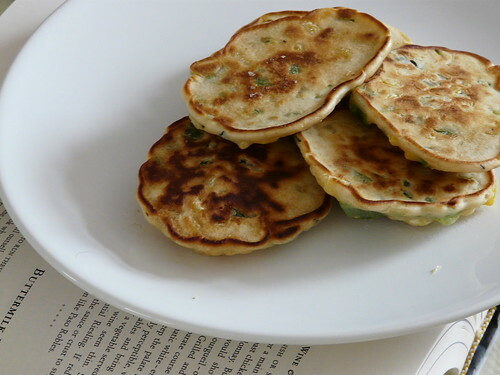 Lisa – I have made them with chilli and they were great but, unusually for me too, I preferred them without. Johanna – Agreed. Worth the disasters. Aforkfullofspaghetti – Quite possibly. Though I tried them with sweet chilli sauce and it wasn’t good! Chelsea – I’m in full blown summer mood! Siri – Ooooh, they sound good. Post about them. Very good of you to give him one! These would work well with a nice creamy dip I reckon. People dont make these nuch but there is so much that you could do with them! Sounds fair to me. How delicious, darls. These look really good and simple/quick ’nuff for a weekend lunch – I do like that. I’ve been waiting for this recipe and have found it really good and tasty. (Not too heavy on the calories either!) Thanks. Somehow I missed this post back when it was new, but wow those look delicious. 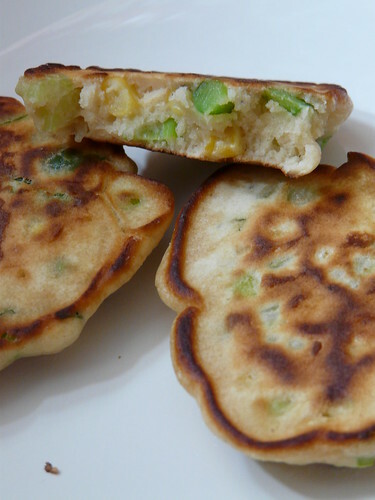 A savory fritter is one of my favorite foods that I often forget about until I’m biting into one … I hope to try these!